Austin Carter (L) discusses with colleagues at the office of EBrand Index Value (EBIV). 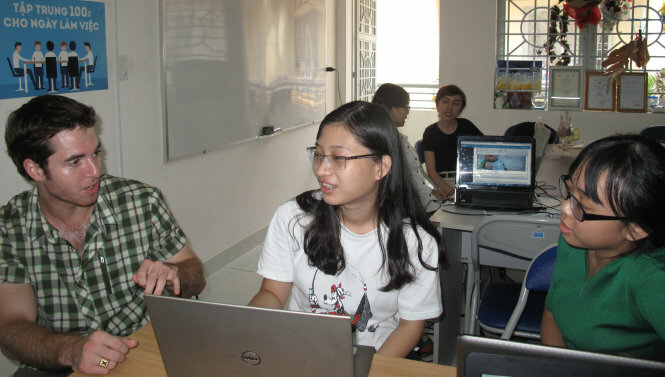 Two young men from Vietnam and Canada have turned their vision of helping Vietnamese learners pick the right school into the Southeast Asian country’s first education review community. Vietnamese Ho Duc Hoan, 26, and Canadian Austin Carter, 24, met in France while the two were attending the Catholic University of Lyon back in 2013. With a common passion for startups, they kept in touch after graduation to exchange ideas on a possible startup on which they could work together. The decisive moment came last June, when Carter decided to quit his high-paying job in Canada and came to Vietnam to start working on their first education startup upon the suggestion of his Vietnamese friend. Hoan also gave up an opportunity to work and settle down in France to pay full attention to his ideal of creating a platform where learners could leave comments and reviews on educational institutions in the country. His idea of such a platform came as a result of his own observation of how Vietnamese people are treated with a lack of credibility abroad. Hoan said such observations had led him to think of a way to improve the credibility of Vietnamese individuals and organizations, in order to bolster the image of his country in general. Launched in 2015, Hoan and Carter’s startup EBrand Index Value (EBIV) revolves around offering users a platform to give reviews and scores on universities, colleges, language centers, and clubs in Vietnam. As of November, the website of EBIV had been visited nearly 280,000 times. It is now offering over 20,000 user-generated reviews on educational facilities in the country. The startup has been honored at several local startup competitions such as Startup Wheel 2016 and Hatch! Battle 2016, and will represent Vietnam at the SLUSH international startup meeting in Finland later this month. Despite such success, Hoan said he also faced great challenges during the first few months following the launch of EBIV. During the period, the duo’s platform targeted a much wider user base, allowing users to submit reviews on even kindergartens and high schools, which soon proved counterproductive as the site became jammed with unhelpful information. The initial difficulty prompted the two to adjust their strategy to target only higher education institutions. The two said they are looking to expand EBIV to users in other Southeast Asian countries and seek funds in 2017, while revealing their plan to include photo and video reviews in the near future.